Congrats, Kristina and Happy Thanksgiving to ALL! So the vegan chef, Kristina, won on Cutthroat Kitchen last night!! And she took home the largest amount of money ever on this show. I fell asleep and missed the end but the corn chowder she made was gorgeous and she used mushrooms as her meat substitute in her second dish and the judges LOVED it! It is refreshing to see vegan food hold up against traditional dishes. She happened to have been very cute and got away with taunting her opponents about how it was going to feel to lose to a vegan. Today, Thanksgiving, there will be a blend of all kinds of foods and plenty for everyone to enjoy. Actually, the word that keeps going through my mind is ABUNDANCE. I am grateful for an abundance of food, drink, family and above all else, LOVE. My heart is so full….the glass is not half full, it’s overflowing! Time to head back to the kitchen and the parade and then the dog show before our first JonesZipp Thanksgiving gets under way. While I am missing a few of my favorite people from this celebration today, I am so thankful they are with family and loved ones. Wherever YOU are, I hope that you are smiling. Happy Thanksgiving. Get Your Fitness, Find Your Peace……….. Watching all the news from Ferguson and feeling like the older I get, the less I understand. Since I was not there the night this happened, I know that I cannot know the truth. What I do know that violence is NEVER the answer and the whole situation makes me very sad…. Pretty much everything else makes me happy, though and I am especially excited for the first blending of the Jones/Zipp family Thanksgiving and have an abundance of gratitude in my heart. I will be at the gym this morning for Senior Strength, tonight for 6pm cardio/strength combo and 7pm yoga/Pilates stretch and stress reduction. Tomorrow, regular schedule as well and Friday SilverSneakers class at 11:30. So come on out and get in some fitness for your body and mind, as it always makes us feel better (if not during, certainly after). While there aren’t enough hours in the day, or days in the week between now and Jan 1., taking care of ourselves is the best way we can take care of others so wherever you can find your peaceandfitness, make sure to JUST DO IT! Mind if I Work in? Let’s leave the elephant tusks on the elephant, where they belong. I am sure, though, those big, gentle and smart guys wouldn’t mind spending a little time as your workout partner…….It’s Monday. Let’s get our workout week started! 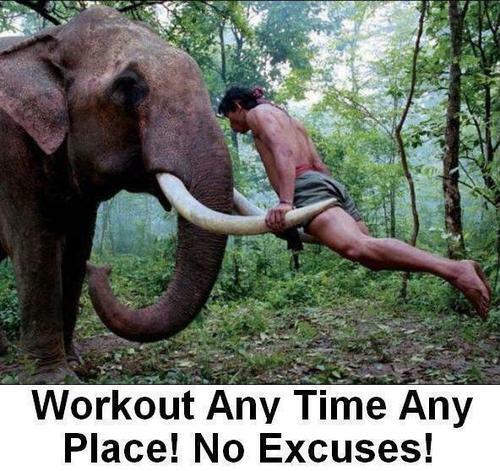 NO EXCUSES! These findings made big news last week. While 3 glasses a day seems like a lot for an adult, if it can do this to adults, why would it be any different for children? Additionally, as women approach menopause and signs of osteopenia begin showing, many resort to adding more milk back into their diet. All of my research has led me to believe that what happens when we drink cows milk is that the incoming calcium signals our bones to actually leak out some. This would be OK, except the calcium from cows milk is NOT readily absorbed by our bodies, so we leak out more than we take in, all the while thinking that “milk does a body good.” Funny, but when I just Googled “best sources of calcium,” the top article was about NON dairy sources. Beans, nuts, seeds, dark leafy veggies, fortified cereals and juices–they all provide calcium that won’t cause the stored calcium to leak the way milk does. The one thing the article doesn’t address is the importance of strength training. 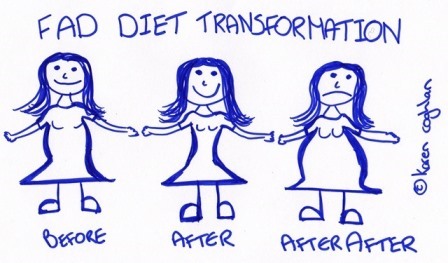 I can’t think of a single food on this planet that has the same bone building effects of proper exercise. Every time you work a muscle, the muscle tugs on the nearby bones causing not just the muscles to get stronger, but the bones to get thicker. If you just look at the hands of a farmer, you will see some big bones. You may even notice yourself that your dominant hand has thicker bones and knuckles. This is enough proof to me. Here are some of the highlights (and they are disturbing) from an article by Dr. Thomas Campbell, but feel free to do your own homework. One thing I notice in my research is that even the proponents in favor of milk say it builds strong MUSCLES (not bones). 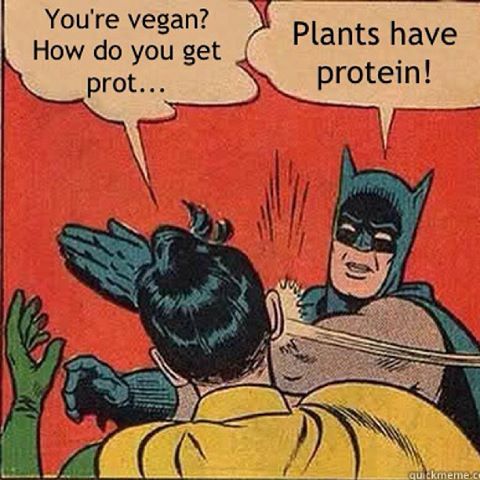 Of course milk is a very high protein food and protein does feed our muscles, but as someone who exercises hours a day and thrives on a plant-based diet, my muscles never feel deprived. Wishing you a happy and peaceful Vegan (Feast) Thursday. I miss my Thursday night crowd like crazy but I am forever thankful for all the dinners we had together and for all they taught me, by example, about living life vegan style. As I turn 57 next month, I feel incredibly strong, healthy and peaceful in my soul!